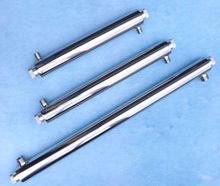 Normally used for final filtration applications in clean rooms, computer suites, asbsestos removal areas, hospital operating theatres and any site requiring ultra clean conditions. The filter media is a water repellent pleated micro-glass fibre paper, each pleat is separated either by a kraft paper or aluminium separator. The completed pleat pack is then bonded into a frame which may be of high density particle board, galvanised mild steel, stainless steel or aluminium. Neoprene gaskets may be fitted to either or both filter faces. By extending the surface area it is possible to increase the flow rate for a given size of filter. Approximately twice the flow rate may be achieved through the same size of HEPA filter by extending the surface area - this is accompanied by a slight increase is pressure drop. Face grilles are available as an option. Filter medias are DOP tested to guarantee the efficiency at retaining particles of a specific size (0.3 microns). Our HEPA filters are rated at the percentage efficiency of removing 0.3 micron particles and we offer ratings of between 95 and 99.997%. All HEPA filters that we supply are 100% scanned for leak detection to ensure that the filters perform to the stated specification Test Certificates are available on request. Designed for air intake and extract systems of critical applications where high efficiency filtration is necessary. The multi-wedge system provides a much larger media area for higher airflow capacity than standard deep pleat HEPA filters. These filters are subjected to full quality assurance procedures and each filter is individually leak tested, certified and numbered for tracking. Manufactured from non fibre-shedding micro-fibre paper or polypropylene composite media the filter packs are mini pleated with the pleats separated by a continuous thermoplastic cord. 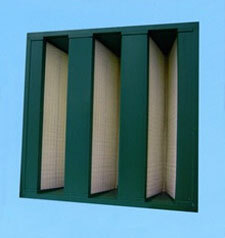 The filter packs are then sealed with Polyurethane sealant into a galvanised steel or MDF case. The are then fitted with gaskets as required. Multiwedge HEPA's are available with efficiency of H13, in a range of standard cases with nominal airflow rates up to 4000m3/hr. Choice of 20mm header (standard) or 25mm. The rigid bag filters represent a considerable technological innovation in comparison with traditional bag filters. 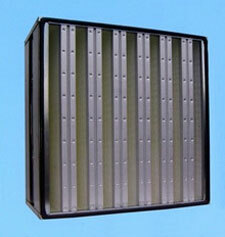 These filters can present many advantages when used as first installation or as replacements to traditional bag filters. 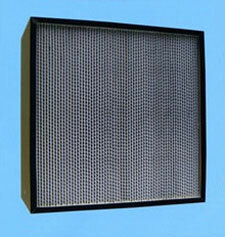 The RP filters, with expanded cellular polypropylene pressed frame, are incinerable without releasing toxins. Polyhedral mini-pleat absolute rated HEPA filters with either synthetic media or glass fibre paper media permanently bonded into a plastic carrier frame with two component cold molded polyurethane. The mini pleats are separated by cotton threads hot melt glued into position. Maximum operating temperature 80 deg. C at 100% RH. The filter may be incinerated without emission of toxic gases.